Today I am in checking out of this hostel, and moving to a hotel. I actually like this hostel-the people are friendly, both those who work here and the other guests. I have become somewhat acclimated to being in hostels-In England I purchased a padlock for the lockers, and I know the right questions to ask,-such as how much are towels? etc. 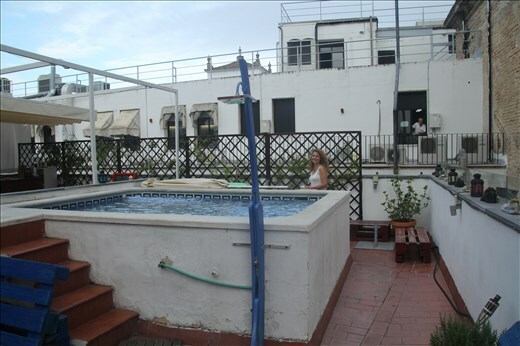 I would have stayed for another night but this one is booked, and rather then move to another hostel I will go to a hotel-again, i like to alternate for a new perspective, and the hotel is less then $45.00 per night. And hostels have clear advantages-once you get over no personal space, and needing to keep your wallet, shoes and change of clothes on your bed, and having to deal with a top bunk, (as the lower bunks are the first to go, and I never seem to get them), there are clear advantages. The price is about 1/4 to 1/2 of that of a hotel, and it is nice to meet others while eating breakfast (by the way, included in many hostels), using the computer, or being in the main lounge. The other part of hostel living is it reminds me of being in college. There seem to be cliques here, and the same type of groups as in college- a group of chinese students who keep to themselves, the overly confident types who make friends with everyone (and I would like to hate but can't), and the popular kids who go out every night but don't invite me. One girl with a nose ring gave me the evil eye. Sort of ridiculous-possible reasons they may not invite me is (a) I am not a girl (b) I started college before they we're born. The surreal live. Tonight I will sleep comfortably in my own room (I hope), have clean, fresh, towels (I hope), and my own bathroom (I hope), and miss it. So I will return to the hostel live. And of course, like college students, these guys must hook up-and in a 8-room dorm, where do they do it?